It’s that time of year when Oscar talk is everywhere. For some releases, the Oscars present an opportunity to slap a bunch of “winner” stickers or notes on a Blu-ray or DVD box, which is why the months following the awards often feature some of the big home releases for the previous year’s best films. Nominated for 11 Academy Awards, Life of Pi very much falls into this category and will be hitting 3D Blu-ray, Blu-ray, and DVD on March 12. 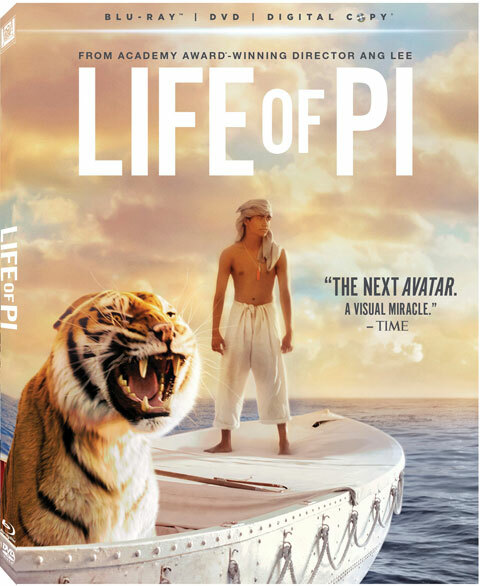 Based on the book of the same name by Yann Martel, a book that many readers believed would be impossible to pursue on film, Ang Lee’s Life of Pi tells the story of Pi Patel, a young man who jumps into a lifeboat during the course of a shipwreck and ends up spending months on the boat with a Bengal tiger named Richard Parker. It’s the adventure of a lifetime and a visual treat for viewers; in short, the type of film that may be worth owning. Normally, I’m not the first person to advocate shelling out the extra cash to purchase a 3D copy of a film, but if your television does have 3D capacity, Life of Pi should be a good opportunity to use it. Not only does the film have some of the best 3D I’ve ever seen, the 3D copies of the flick will come with a bunch of footage that not even the regular Blu-ray copies will have, including deleted scenes and VFX progressions. You can check out the list of bonus features for both the 3D Blu-ray combo pack and the Blu-ray combo pack, below.